I could have sworn this was reported or at least leaked months ago, and maybe it was, but the official news of DC Comics characters and covers appearing on stamps has certainly delighted a lot of folks and put some e-mails into my mailbox from older relatives. Mark Evanier covered it well here, with follow-ups here and here. 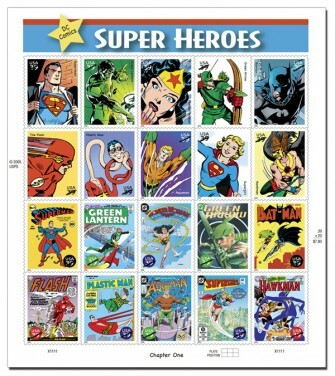 I always like reading the press release on the background of new stamps, and you can get the DC backgrounds there, too. You cand find bigger versions of all these stamps here. As I understand it, stamp initiatives like this one exist in both that social recognition sense but also, crucially, to encourage collectors to buy stamps that will not be exchanged for that amount of US Post Office services.